The District Convention will convene at 10:00 a.m. on Saturday, January 12th at Wayne County Community College Mary Stempfle University Center, 19305 Vernier, Harper Woods 48225. Registration will begin at 9:00 a.m. and continue until 10:15 a.m. The purpose of this convention shall be to elect one (1) male and one (1) female and one (1) male alternate and one (1) female alternate to the Credentialing, Resolution, and Rules committees of the State Convention and to consider resolutions to be forwarded to the state party. Season’s Greetings and Happy New Year, Fellow 14th District Democrats! Greetings, Democrats! As we continue our holiday celebrations and the 2018 year draws to a close, I want to thank you again for all of your hard work. Your voting, your campaigning, your organizing, your attending, your contributions, your candidacies made the difference in Michigan. In a few days time, we will have a Democratic Governor, a Democratic Lieutenant Governor, a Democratic Secretary of State, a Democratic Attorney General, a Democratic-majority State Board of Education, and Democratic-majorities on the Wayne State University, Michigan State University, and University of Michigan boards. We have five more Democrats in the State Senate and five more Democrats in the State House — but we need to work toward Democratic legislative majorities at long last. For the first time in forty years, Democrats now even have a majority on the Oakland County Commission! 14th Congressional District Meeting and Democratic Convention Saturday, January 12thFor the District’s January meeting, the District Convention will convene at 10:00 a.m. on Saturday, January 12th at Wayne County Community College Mary Stempfle University Center, 19305 Vernier, Harper Woods 48225. Registration will begin at 9:00 a.m. and continue until 10:15 a.m. The purpose of this convention shall be to elect one (1) male and one (1) female and one (1) male alternate and one (1) female alternate to the Credentialing, Resolution, and Rules committees of the State Convention and to consider resolutions to be forwarded to the state party. Michigan Democratic Party “Spring” State Convention Saturday, February 2ndThe Michigan Democratic Party Convention is Saturday, February 2nd, 2019 at the Cobo Center in Downtown Detroit. Among other activities, this is the convention when the state Democratic Party leadership will be elected for the next two years. The 14th District Democrats will convene at Room 260 at 12:30 p.m. and will elect District Leadership for the next two years. – March 9, 2019 — 14th District Monthly Meeting at the Oak Park Parks and Recreation Building, 14300 Oak Park Boulevard, Oak Park 48237. Executive Board Meeting 10:00 a.m. General Membership Meeting 11:00 a.m.
– April 13, 2019 — 14th District Monthly Meeting at the Oak Park Parks and Recreation Building, 14300 Oak Park Boulevard, Oak Park 48237. Executive Board Meeting 10:00 a.m. General Membership Meeting 11:00 a.m.
– May 11, 2019 — 14th District Monthly Meeting at the Northwest Activities Center, 18100 Meyers, Detroit 48221. Executive Board Meeting 10:00 a.m. General Membership Meeting 11:00 a.m.
– June 8, 2019 — 14th District Monthly Meeting at the Northwest Activities Center, 18100 Meyers, Detroit 48221. Executive Board Meeting 10:00 a.m. General Membership Meeting 11:00 a.m.
– July 13, 2019 — 14th District Monthly Meeting at the Oak Park Parks and Recreation Building, 14300 Oak Park Boulevard, Oak Park 48237. Executive Board Meeting 10:00 a.m. General Membership Meeting 11:00 a.m.
– August 30, 2019 — Congresswoman Brenda Lawrence Red White and Blue Soiree, an end of summer celebration and fundraiser. Plum Hollow Country Club, Southfield. – September 14, 2019 — 14th District Monthly Meeting at the Northwest Activities Center, 18100 Meyers, Detroit 48221. Executive Board Meeting 10:00 a.m. General Membership Meeting 11:00 a.m.
– October 12, 2019 — 14th District Monthly Meeting at the Northwest Activities Center, 18100 Meyers, Detroit 48221. Executive Board Meeting 10:00 a.m. General Membership Meeting 11:00 a.m.
– October 20, 2019 — Congresswoman Brenda Lawrence Birthday Celebration. Details forthcoming upon confirmation. – November 9, 2019 — 14th District Monthly Meeting at Shield’s Pizza, 25101 Telegraph Road, Southfield 48034. Executive Board Meeting 10:00 a.m. General Membership Meeting 11:00 a.m.
– December 14, 2019 — 14th District and Congresswoman Brenda Lawrence Holiday Party. Location and time to be determined. Saturday, December 15th, 11:00 a.m.
Chairman Rick Blocker and Congresswoman Brenda Lawrence invite you to join us as we express our thanks for your support and activism, celebrate this year’s big Democratic wins in Michigan, and prepare to organize for electing a new President, returning Gary Peters to the U.S. Senate, and taking the Michigan House of Representatives back from Republicans. No Cost to Attend. Instead, please bring a toy donation for children in need, which will be delivered on behalf of the 14th District Democrats! Sunday, December 16th, 2:00 p.m.
Posted on December 14, 2018 Leave a comment on Upcoming Democratic Events! Reminder: Holiday Party December 15th! All Democrats Invited. REMINDER: The original location of Southfield was changed due to space needs. Again, this Saturday the holiday party is at the Greektown location in Downtown Detroit. Posted on December 10, 2018 Leave a comment on Reminder: Holiday Party December 15th! All Democrats Invited. 14th District Holiday Party! Saturday, December 15th. Please bring a toy donation for children in need, which will be delivered on behalf of the 14th District Democrats! Posted on November 28, 2018 December 10, 2018 Leave a comment on 14th District Holiday Party! Saturday, December 15th. October Activities Update, including our Meeting Oct. 13 in Harper Woods! Please come out in support of Democratic Party Attorney General nominee Dana Nessel tonight at Hope United Methodist Church, 26275 Northwestern Highway, Southfield. Happening 7:00 to 9:00 p.m. Free and open to the public! Greetings, Democrats! There is much work to be done to finish strong in these Midterm Elections. The final 14th District Democratic meeting before the Election is this Saturday, October 13th. The Executive Committee meeting is at 10:00 a.m. and the General Membership meeting is at 11:00 a.m. The October meeting is taking place at the Wayne County Community College University Center, 19305 Vernier Road, Harper Woods 48225. Come out in support of our Congresswoman for her biggest fundraiser of the year! It is happening Sunday, October 14th from 2:00 to 4:00 p.m. Held at the historic, recently renovated Detroit Club, 712 Cass Avenue, Detroit 48226. Tickets are $100, but contributions of any amount will be accepted for 14th District Democrats. To RSVP and for more information, call (248) 410-0702. INFORMATION FOR OUR AREA’S MICHIGAN DEMOCRATIC PARTY CAMPAIGN OFFICES AND HOW YOU CAN GET PLUGGED IN WITH HELPING GET OUT THE DEMOCRATIC VOTE! – Friday, October 12th — Rosemary Bayer for State Senate Spaghetti Fundraiser Help us flip this Republican open seat to Democratic blue! 5:00 to 7:00 p.m. Held at Unity Church of Pontiac, 780 W. Huron Street, Pontiac 48342. Tickets are $10. To RSVP or for more information, call (248) 934-0555. 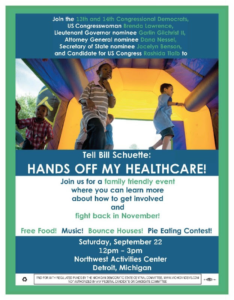 – Tuesday, October 16th — Lieutenant Governor Nominee Garlin Gilchrist Campaigns in Pontiac, 4:30 to 6:00 p.m. Held at the Bowens Senior Center, 52 Bagley Street, Pontiac 48341. – Wednesday, October 17th — Grosse Pointe Democratic Club Meeting, 7:00 p.m., Held at the Campaign Office, 17700 Mack Avenue, Grosse Pointe. Featuring Congresswoman Brenda Lawrence as guest speaker. – Thursday, October 18th — Pontiac Democratic Club Candidates Forum, 7:00 to 9:00 p.m. Held at New Bethel Missionary Baptist Church, 174 Branch Street, Pontiac 48341. Call (248) 410-0702 for more information. – Thursday, November 1st — Michigan Democratic Party Women’s Caucus Get Out The Vote Rally. 6:00 to 8:00 p.m. Held at the Teamsters Hall, 2700 Trumbull in Detroit. – Saturday, November 3rd — Congresswoman Brenda Lawrence Pre-Election Prayer Breakfast, 10:00 a.m. to 12:00 p.m. Held at the Southfield Westin, 1500 Town Center, Southfield. For more information, call (248) 410-0702. – Tuesday, November 6th — General Election Day: Time for a Blue Wave in 2018, if we do the work! 25 days to go! Posted on October 11, 2018 Leave a comment on October Activities Update, including our Meeting Oct. 13 in Harper Woods! This Saturday, September 22 from 12:00 to 3:00 pm! Join us at Northwest Activities Center in Detroit. Lieutenant Governor Nominee Garlin Gilchrist, Congresswoman Brenda Lawrence, Attorney General Nominee Dana Nessel, Congressional Nominee Rashida Tlaib, and more will be there to rally with us! There is so much on the line in 2018! Get involved and support the Democratic Ticket! Grosse Pointe Democratic Club hosts a Meet & Greet for Samuel Bagenstos for Michigan Supreme Court Friday, September 14, 2018 from 4:30 p.m. – 6:30 p.m. at 15318 E. Jefferson, Grosse Pointe Park MI 48230. For more info or to rsvp email hbendure@gmail.com. 12th District Democrats are holding their annual Steak Fry fundraiser this Saturday, September 15th from 4:00 p.m. – 6:00 p.m. at UAW Local 3000 at 22693 Van Horn, Woodhaven, MI. Southfield Lathrup Village Dems Club Meeting is Wednesday, September 19th 2018, at Southfield Parks & Recs located at 26000 Evergreen Rd, Southfield, MI 48076. Oakland County Democratic Party’s next meeting is Tuesday, October 9th 2018 at Plumbers Hall 555 Horace Brown Dr. Madison Heights, MI 48071. 14th Congressional District’s next meeting Executive Board (10:00 a.m.) & General Meeting (11:00 a.m.) will be held Saturday, October 13, 2018 at WC3 19305 Vernier Rd, Harper Woods, MI 48225. The One Campaign for Michigan is looking for volunteers! Posted on August 4, 2018 Leave a comment on August Get Out The Vote Update! Registration 9:30 to 10:30 a.m. In accordance with the Fall 2018 Call to Convention issued by the State Central Committee in March, District and County Conventions are to be held statewide on Saturday, August 11, 2018. County Conventions must be held in all counties within the 1st through 8th and 10th Districts. In those counties comprised of more than one Congressional District, each portion of the county within one Congressional District will be considered a “county” and will hold a convention on August 11, 2018. Each convention will convene at the time and hour designated in the Call issued by each County or District Committee. District conventions must be held in the 9th, 11th, 12th, 13th, and 14th Congressional Districts on August 11, 2018 at the place and hour designated in the Call issued by each Congressional District Committee. The purpose of the conventions will be to elect members & alternates to each of the three convention committees: Rules, Resolutions, and Credentials (suggested allocations will be available next month).The secondary purpose of these conventions will be to consider resolutions and platform planks to be forwarded to the state party for consideration. In order to vote at any Convention, Caucus or meeting of any unit of the MDP at any level, a person must be a member of the MDP for at least thirty (30) days prior to that Convention, Caucus or meeting. A Party member must be a qualified and registered elector in order to vote on nominations for public office. Precinct delegates, Democratic elected officials and Democratic nominees to partisan offices are exempt from the thirty (30) day advance membership requirement. However, Precinct Delegates, Democratic elected officials and Democratic nominees to partisan offices must be a member of the MDP in order to vote at any Convention, Caucus or meeting of any unit of the MDP at any level. Former members of the MDP whose membership has lapsed in the thirty (30) days preceding any Convention, Caucus, or meeting of any unit of the MDP may renew their membership on the day of the Convention, Caucus, or meeting and shall be permitted to vote on that date. Agenda: The Committee shall meet to consider rules for the State Convention and to receive training in those rules and on proportional voting. A call in option will be provided to chairs for distribution to committee members. Agenda: The Committee shall meet to consider resolutions & platform planks proposed by County and District Conventions for the State Convention’s consideration and compile the proposed State Party Platform for 2018. The Committee shall meet at the call of the Chair of the Michigan Democratic Party at the convention if necessary. Posted on July 25, 2018 August 4, 2018 Leave a comment on Call to District Convention!